It’s not too late. Go now! RIGHT NOW! 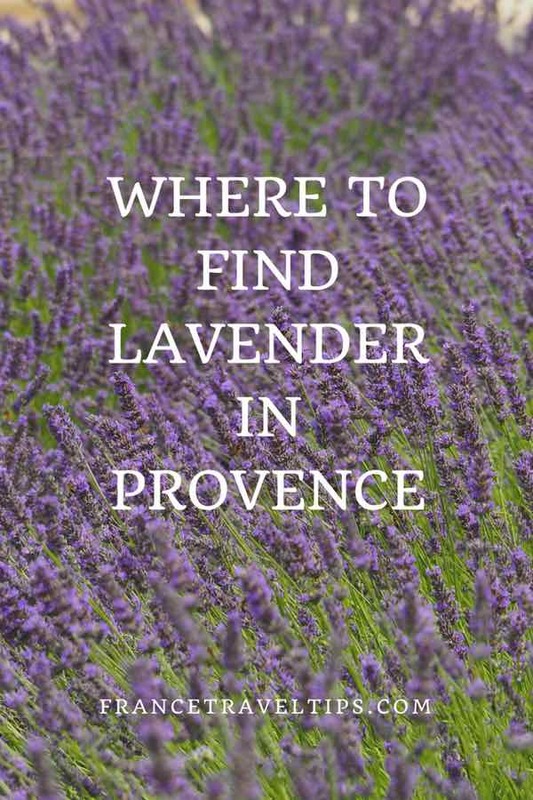 This post will tell you where you can find lavender in Provence because I just got back from France and searched high and low for fields (champs) of lavender during my week in the Vaucluse. I was determined to see fields of lavender so I could take photographs. I’m finding that more and more, I am interested in getting great looking photos from my travels. 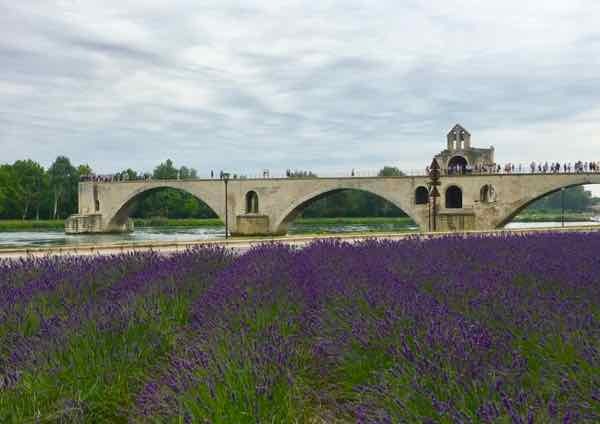 Sadly, during my trip in early June 2017 I only saw a few sparse rows of lavender by Avignon’s Pont Saint-Bénézet. This is why I returned in 2018. The lavender season runs from June to August, depending on how wet or dry the Spring is so if you go too early or too late, you might be out of luck. Even though I reached out to tourism boards, other bloggers, and locals, no one could give me a definitive answer as to when the best time would be to go. Most people came back saying that the end of June/first week of July might be good, but there would be no guarantees. So I chose the first week in July. I subsequently found out that the season for lavender in 2018 started late due to the rain in the Spring but that didn’t pose a problem for me. A lot depends on your location. 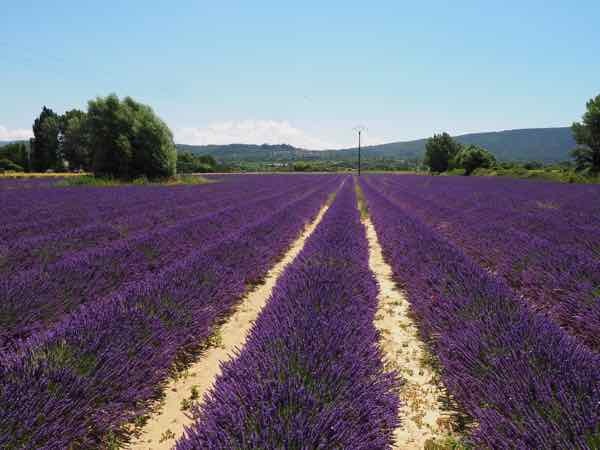 The lavender in some areas of Provence bloom earlier than in other areas. My base was in the town of Murs, where I had rented a house for a week. 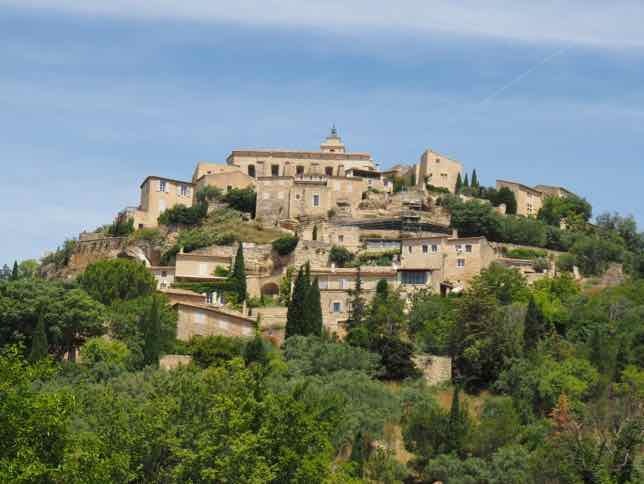 Murs is located just 7.5 kilometres north-east of Gordes and was a good place to be situated. Most people will say that the lavender is most plentiful near the town of Sault and Valensole, but there are certainly other places where you can see it. Because I didn’t want to spend my entire trip in a car, I decided to focus my efforts on the areas near Bonnieux in the south and Sault in the north east. I decided that I would only make the 1.5 hour journey east to Valensole if I was truly unsuccessful in getting good photographs of the lavender. 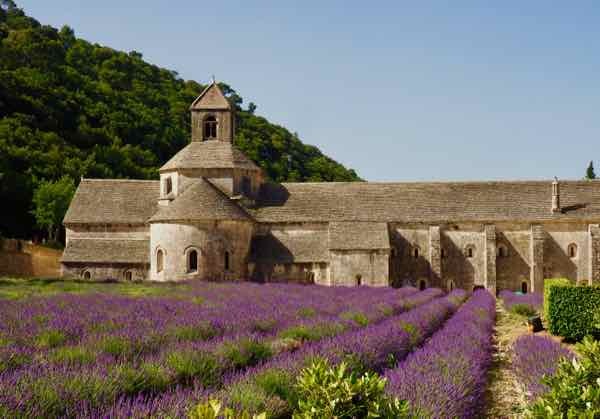 When you do a Google search for lavender in France, one of the most frequent photos you are shown is lavender in front of the 900 year old Cistercian Abbey de Senanque, which is located near Gordes and Murs (Take D177, direction Venasque. 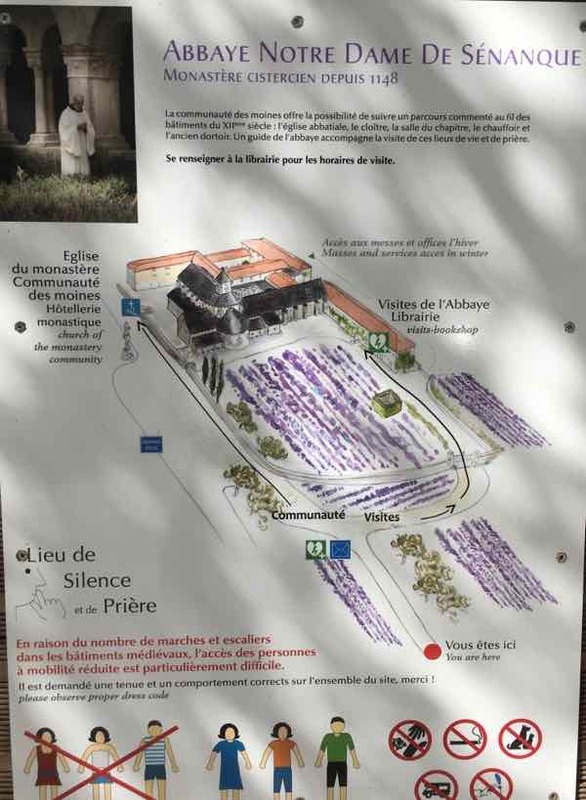 Although you could walk from Gordes to the Abbey (5 km), there is free parking. I arrived before 10:00 and would advise you to do the same. You’ll be beating the crowds from the numerous tour buses that visit. Do consider paying the admission to go inside the Abbey as well as it is very impressive. 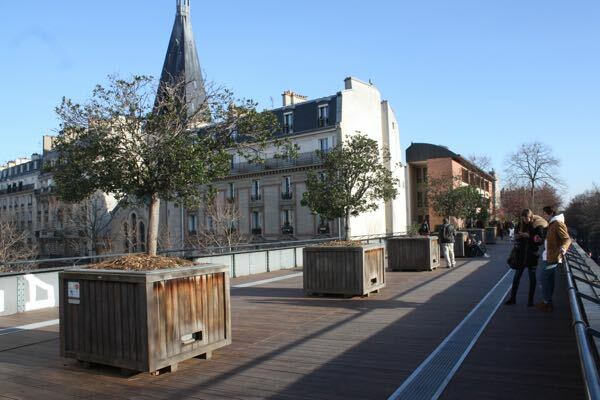 Guided tours for individuals are only in French. Just remember, however, that you need to be properly dressed (ie. no tank tops or cycling shorts). While you cannot walk into the lavender fields at the Abbey, you will be able to take photographs. In addition to seeing lavender on the D15 from Gordes to Murs, one town to approach is Bonnieux. This is a great town wth lots of shops and a weekly market. Peter Maybe, who wrote the widely successful book, “A Year In Provence” made many towns in the Vaucluse famous and Bonnieux is one of them. Its what you would imagine a Provencal town to look like. I had a lovely late lunch at the Cafe de la Poste in the hilltop village of Goult: a glass of rose wine and a Provencal salad with melon, marinated vegetables, artichokes, tomatoes, courgettes (zucchinis), mushrooms, and olives for 20 Euros. D942 road follows the Gorges de la Nesque and you will head eastward toward Sault. As you approach the town of Monieux you will see a number of large fields of lavender. 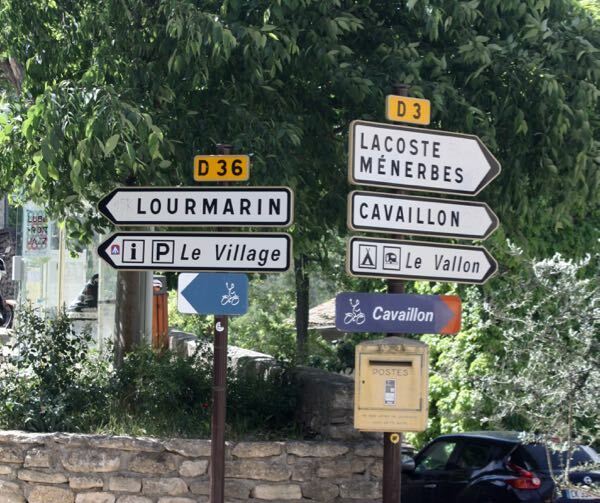 They are nicely positioned in front of the mountains of the Vaucluse and not far from Mont Ventoux—-that famous mountain that the Tour de France riders climb. This small town sits high on a hill and is surrounded by many lavender fields. 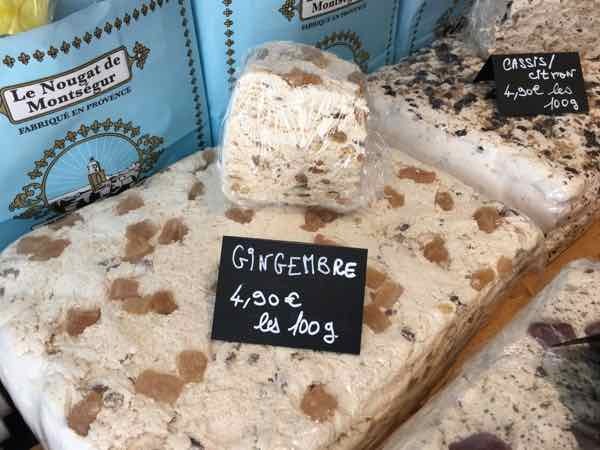 I enjoyed walking around, purchasing some nougat, and having a coffee at the cafe/restaurant La Promenade which provided excellent views of the valley. 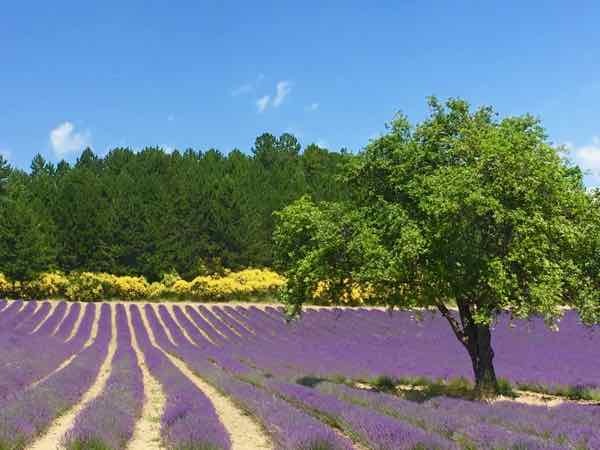 This is the town that seems to be the epicentre of lavender because from here there are a number of distilleries and places to learn more about the production of lavender oil. 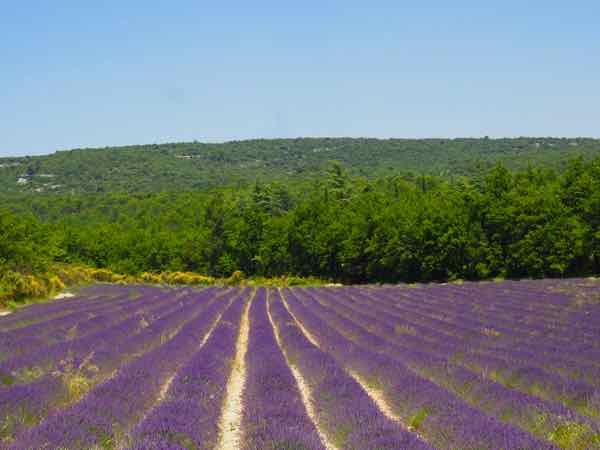 As I headed out of Sault, going northward toward Aurel, I encountered another field of lavender and when I crossed the (departmental) border from the Vaucluse to the Drome, there was more lavender. I reached Montbrun-les-Bains and walked around this sleepy but picturesque town, again with great views of the valley. After my little adventure up the D942 I wanted to visit some farms and distilleries. I headed back to Sault and then up D164. 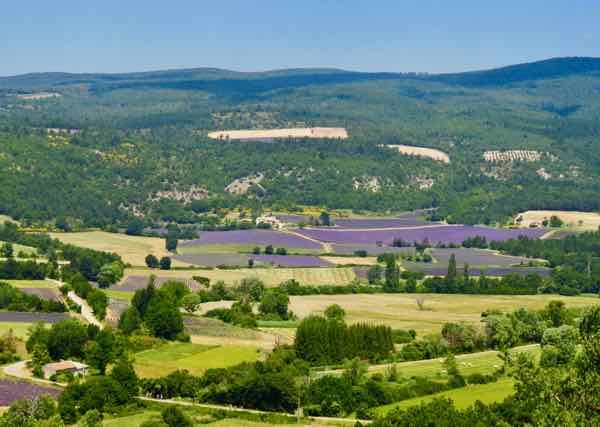 I only went a short distance before I came upon Vallon des Lavandes, a family run business that produces lavender oil and other products such as soap. I was able to have an English-speaking tour. I also visited La Ferme aux Lavender, a wonderful little oasis that has outdoor seating with umbrellas for a drink or meal. It is surrounded by a garden with a few animals (bunny rabbit!) and a kiosk where products are sold. 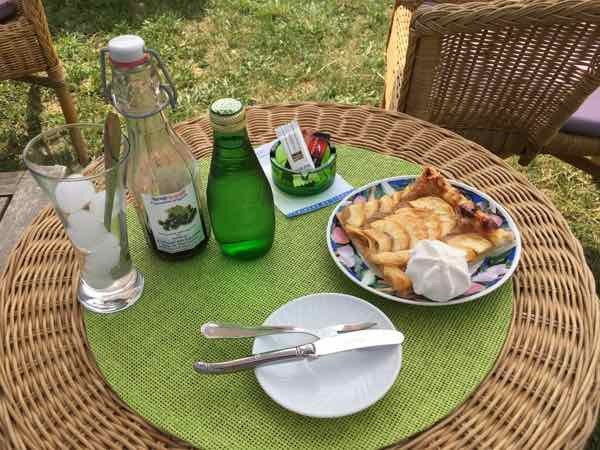 I enjoyed my tarte aux pommel (apple tart) and Cassis syrup (no alcohol) with sparkling water so much that I purchased a small bottle of the syrup. Had I continued along the D164 I could have driven to Mont Ventoux but I simply didn’t have the time. My journey from Murs to Sault and back took up most of the day (8 hours). 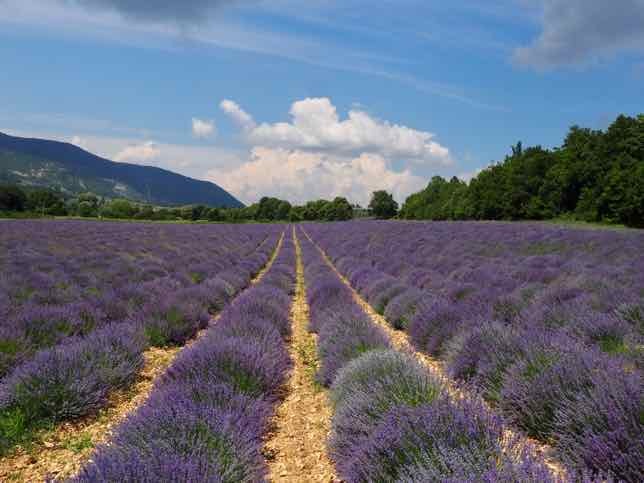 If you’ve been to France during the lavender season, where did you find lavender in Provence? Please share! I’m so glad you got to see so much lavender! It’s such a beautiful area and the lavender makes it even more beautiful! So true. I think even now, 2 weeks after those photos were taken, the lavender would really be in full bloom. The purple is so bold and bright. Beautiful! Did you bring some home? Sadly no. I was too concerned it would be confiscated by Canada customs. I searched on their website and couldn’t get a definitive answer as to whether I could take it home. 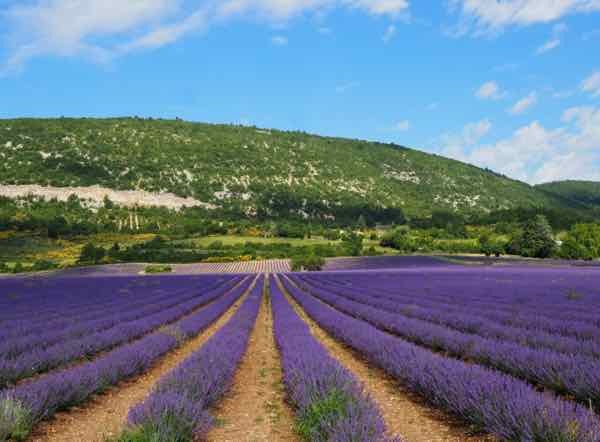 I am hoping to go the France next year, and seeing the lavender in bloom is high on my list of must sees. Trying to figure out when to go, when it is not too hot is proving challenging. I was thinking of the third week of June, but it sounds like that may be too early. You’re right that the hot temperatures will be the issue. Third week in June may be too early; however, it may be better higher up in the Drome Provencal, north of the Vaucluse. Amazing…!!! It’s really such a beautiful place and the lavender makes it even more beautiful too! Want to visit this place once in a lifetime with family and friends.